All Group bookings will be required to pay a 'key and security' deposit of 10000huf per person (or the euro/pound equivalent) upon arrival to the hostel. At check-out, provided nothing has been broken, all keys are returned and no major rules have been broken all deposits will be returned. Full payment is due one week in advance to the arrival date for all groups of 6 guests to 19 guests, & due one month in advance for all groups over 20 guests. This can be paid via PayPal or TransferWise. 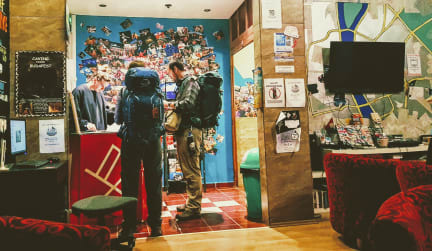 Life out of a backpack can be exhausting, we know, so we believe a great hostel isn’t just about the facilities, it’s about the sense of openness and feeling of being welcomed by friends after weeks or months on the road. We believe a great hostel and the friends you make there can elevate your experience of a city, and that’s why we’ve worked to build this melting pot for backpackers - a place where you can unwind and socialize with a local beer in one of our common areas, or chill in our courtyard as you share stories and experiences with fellow travelers. We aren’t your typical sterile hotel-esque environment. We’re based in a traditional, 19th century Hungarian building full of character, located within the heart of Budapest's central 6th district. Within walking distance of us are some of the city's major sights such as St. Stephen's Basilica and the Chain Bridge, a number of the ruin bars the city is famous for and only a short metro ride from the Szechenyi thermal baths. Although we aren’t a party hostel, we’d love for you to join us on our daily and nightly events such as pub crawls, game evenings and boat parties. We have an awesome little hipster basement bar, frequented by both locals and backpackers that offers €1 beers and live music. We kick off every night here and it’s an ideal environment to just be yourself with good company before you head out for a night with new friends. Our friendly, English speaking team is always available to provide you with inside tips and all the information you need so you can make the most of all the incredible sights Budapest has to offer. Upon check in we like to give all our guests a free map of the city and point out all the best spots, from the major tourist sights to hidden gems and information about the various day events and activities around the city. Aside from a comfortable bed, you can make use of our well equipped kitchen, and if cooking isn't your thing then you can join the team here for our nightly family dinner at only the cost of the ingredients. On top of all that, of course we've got the basics: free WIFI in all the rooms, a communal computer, free tea and coffee, free linen, free towel rental, free maps, free lockers, as well as adapters and padlocks for hire. My stay at Meander for 5 days was absolutely wonderful, if you're a solo backpacker I'd definitely recommend it! Location is perfect, right in the center of Budapest and everything is accessible by walk, people working there are truly amazing and make you feel at home as soon as you arrive, they're always ready to help for any issue you might have! There's a nightout every night if you want to join, Meander is the perfect balance between chill, meeting new people and partying a bit in Budapest! L’auberge est chaleureuse et animée! La cuisine et les chambres sont assez grandes. Le staff est sympathique et organise des événements chaque soir. Très bon rapport qualité-prix! Awesome place ! The staff is awesome ! If you want to have a great time in Budapest and meet some more than nice people, you have the obligation to go to the meander hostel ! Amazing place in an amazing city ! The staff is really welcoming and willing you to spend the nicest time during your stay. Very nice hostel with a nice welcoming staff , always there for you if you need help and always ready to have fun with the guests. 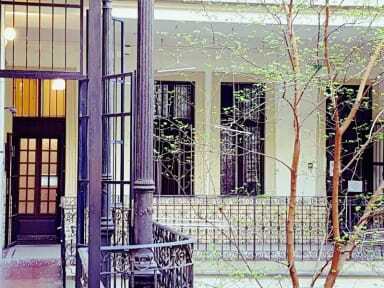 Location is perfect , 5 minutes from metro , shop around the corner and very central, near the basilica. Beds and facilities in general are really nice , you can chill or have fun at the hostel. Beds are nice , hostel beds you can expect . I really recommand this place if you want to meet people and discover Budapest . Nobody's working by night. So no staff was able To help us for anything at night or even give us back our rental for à early check out ! Endroit agréable, un ancien immeuble avec du cachet. Staff très accueillant. Bonne ambiance. Ce qui est dommage, c'est de laisser le chauffage avec les fenêtres ouvertes...les chambres ne sont pas insonorisées. On entend tout ce qui se passe sur le palier. Sinon, il y avait tout ce qu'il fallait. Bien situé.